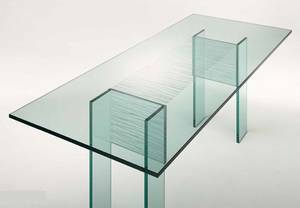 Description A breathtaking modern dining table made entirely from transparent glass (19mm thick). A hand carved design down the centre of the table top flows into the upper part of the bonded glass bases. Custom sizes are available on request.